Product prices and availability are accurate as of 2019-04-21 08:53:21 UTC and are subject to change. Any price and availability information displayed on http://www.amazon.com/ at the time of purchase will apply to the purchase of this product. Author Bookstand is proud to offer Sax Club: Detroit Thorn Birds Defy Mafia - Mafia Works #1 by Bookstand Publishing. Bookstand Publishing offers books by the best indie authors throughout North America and the world. Bookstand Publishing is dedicated to offering original content to a broad audience and promoting great authors, literacy, and freedom of expression. 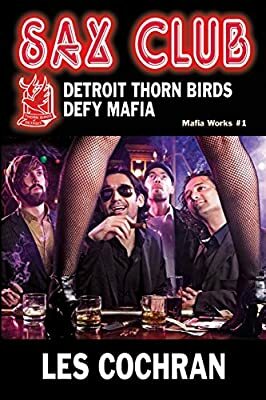 Sax Club: Detroit Thorn Birds Defy Mafia - Mafia Works #1 has generated a lot of interest and excitement and we think it would be an excellent addition to your library. Detroit is hemorrhaging; a criminal juggernaut has brought the city to its knees the Mafia has outwitted, outmaneuvered what is widely known as the nation s most corrupt police force. The city s social fabric is torn beyond repair, neighborhood gangs are rampant--unethical political officials offer no help--the situation is hopeless! Yet, buried deep in small neighborhood enclaves are pockets of people unwilling to succumb to these evil forces; they re clawing for survival, an uphill fight against all odds--to save their homes, their dignity, their way of life--they are the Detroit Thorn Birds. 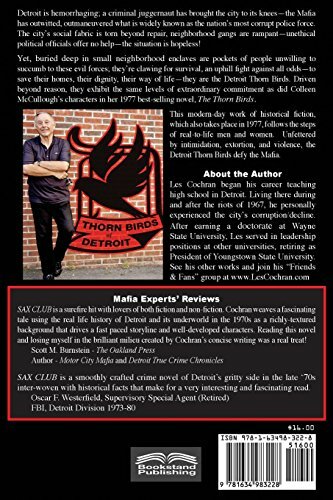 The Detroit Thorn Birds are driven beyond reason, exhibiting the same levels of extraordinary commitment as did Colleen McCullough s characters in her 1977 best-selling novel, The Thorn Birds. This modern-day work of historical fiction, which also takes place in 1977, follows the steps of real-to-life men and women. Unfettered by intimidation, extortion, and violence, the Detroit Thorn Birds challenge the Mafia. Author Bookstand is a participant in the Amazon Services LLC Associates Program, an affiliate advertising program designed to provide a means for sites to earn advertising fees by advertising and linking to Amazon.com, Endless.com, MYHABIT.com, SmallParts.com, or AmazonWireless.com. Amazon, the Amazon logo, AmazonSupply, and the AmazonSupply logo are trademarks of Amazon.com, Inc. or its affiliates.